Shah NH*, Deshmukh M**, Somani A**, Paranjpe SH*** . Pregnancy in a rudimentary horn of uterus is quite rare and represents as a type of ectopic gestation. We report a rare case of a suspected tubal ectopic pregnancy which was diagnosed as rudimentary horn pregnancy on laparoscopy and was surgically managed laparoscopically. Incidence of congenital uterine anomalies in general population vary widely from 0.001-10 %. A rudimentary uterine horn is a type of Mullerian duct anomaly, classified as a unicornuate uterus with a non-communicating horn. This anomaly represents class U4a of ESHRE classification. Pregnancy in a non-communicating rudimentary horn is very rare with an incidence of 1 in 100,000 to 150,000. Continuation of late pregnancy may lead to rupture of uterus, presenting commonly as acute abdominal pain, shock due to hemoperitoneum, and associated with high risk of maternal mortality. 26-year-old primigravida married since 1 year presented with 2 months of amenorrhea and complaints of pain in abdomen since 2 days with a positive urine pregnancy test. General and systemic examination were normal. Per vaginal examination was suggestive of right fornicial fullness and tenderness. There was no vaginal bleeding. All routine blood investigations were normal. Ultrasound was suggestive of right adnexal mass, no evidence of intrauterine gestation or hemoperitoneum. With suspicion of a tubal ectopic pregnancy, decision was taken for laparoscopic exploration. 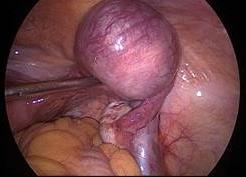 But to our surprise, laparoscopy revealed a hemi uterus with cornual attachment of normal left fallopian tube. The right fallopian tube attached on the right side of a non- communicating rudimentary horn with ectopic gestation in this tube, which was enlarged, congested, and edematous, as seen in figure 1. There was no communication visualized from the rudimentary horn to the uterus (figure 2). Figure 1. Ectopic gestation seen in rudimentary horn of uterus. Figure 2. Thin band with no communication seen between uterus and the horn. Both the ovaries were normal. No hemoperitoneum was seen, as pregnancy was unruptured. The right rudimentary horn was excised along with right fallopian tube using a harmonic scalpel (Figure 3) and hemostasis was checked (Figure 4). Postoperative period was uneventful and patient was discharged on third postoperative day. Figure 3. Removing the horn with the gestation with harmonic scalpel. Figure 4. Picture seen after removal of rudimentary horn with the ectopic gestation. The Mullerian ducts are the primordial anlage of the female reproductive tract. Mullerian duct anomalies result from failure of fusion or absorption of Mullerian ducts. The recent ESHRE classification has systematically categorized the anomalies based on deviations of uterine anatomy, and different degrees of uterine deformity. These defects occur by means of arrests in different stages of Mullerian duct development. Rudimentary horn is result of a lateral fusion defect on contralateral side. The connection between the horn and the uterus may be fibrous or fibromuscular, where 80- 85 % of cases have no communicating channel between the two cavities. Patients with a rudimentary functional cavity commonly present with cyclical or acyclical dysmenorrhea, pelvic and abdominal pain. While the non-communicating cavitated horn is commonly associated with endometriosis probably due to retrograde menses, communicating horns are less symptomatic. Pregnancy in a non-communicating horn is very rare (1: 100000 to 1: 150000). The muscular wall of rudimentary horn of uterus being distensible pregnancy may continue till second trimester and commonly present late. They are associated with complications like rupture of pregnant horn, with 80- 90 % of cases rupturing by mid- trimester and 10% going to term with a fetal salvage rate of 2 %. Pregnancies occurring in the non- communicating rudimentary horn are thought to result from transperitoneal migration of spermatozoa or the fertilized ovum. This suggestion is based on the finding of corpus luteum in the contralateral ovary in 10 % of cases. The pain associated with pregnant rudimentary horns begins mainly in end of 1st trimester and is rarely associated with vaginal bleeding. Excision is usually successfully carried out laparoscopically in unruptured cases as in our case. Laparoscopic management should be encouraged in such cases as it decreases the morbidity and hospital stay and minimizes the blood loss. The American Fertility Society classifications of adnexal adhesions, distal tubal occlusion, tubal occlusion secondary to tubal ligation, tubal pregnancies, Mullerian anomalies and intrauterine adhesions. Fertil Steril 1988; 49(6): 944-55. The Thessaloniki ESHRE/ESGE consensus on diagnosis of female genital anomalies. Grimbizis GF, Di Spiezio Sardo A, Saravelos SH, Gordts S, Exacoustos C, Van Schoubroeck D, et al. Gynecol Surg. 2016;13:1-16. Yoo EH, Chun SH, Woo BH. Laparoscopic resection of a rudimentary horn pregnancy. Acta Obstet Gynecol Scand. 1999; 78(2): 167-8. Dicker D, Nitke S, Shoenfeld A, Fish B, Meizner I, Ben-Rafael Z. Laparoscopic management of rudimentary horn pregnancy. Hum Reprod. 1998; 13(9): 2643-4. Dulemba J, Midgett W. Freeman M. Laparoscopic management of a rudimentary horn pregnancy. J Am Assoc Gynecol Laparosc. 1996; 3(4): 627-30. Yahata T, Kurabayashi T, Ueda H, Kodama S, Chihara T, Tanaka K. Laparoscopic management of rudimentary horn pregnancy: a case report. J Reprod Med. 1998; 43(3): 223-6. Kriplani A, Relan S, Mittai S, Buckshee K. Pre- rupture diagnosis and management of rudimentary horn in the first trimester. Eur J Obstet Gynecol Reprod Biol. 1995; 58(2): 203-5.